Green is the color for organ donation and is a symbol of hope for the millions who await an organ transplant surgery. The iconic Chhatrapati Shivaji Terminus Mumbai (CSTM) railway station was lit green on 27th November, India’s National Organ Donation Day as a tribute to organ donors and their families. MOHAN (Multi Organ Harvesting Aid Network) Foundation partnered with SBI Foundation who have partnered with each other through the ‘Gift Hope, Gift Life’ project, undertook this initiative. On this same day a few hospitals in Mangaluru, Karnataka also turned green to create awareness about organ donation among the public. The Indian Medical Association (IMA) also organized a walkathon on Sunday in a Manguluru stadium to mark the organ donation day. Earlier this year in February, MOHAN Foundation was also instrumental in lighting up the Qutub Minar monument green. Across the world many cities likes Toronto, Texas and Glasgow have lit up some of their landmark buildings green as part of various organ donation campaigns in the past. The organ donation cause is conventionally represented by a green ribbon. Green symbolises hope for the millions who are awaiting a second chance at life through organ transplantation. It also reminds of those who have died waiting for a life-saving organ. Most importantly, it conveys our gratitude to organ donors and their families for giving the supreme gift of all – the gift of life. According to MOHAN Foundation despite there being a nearly fourfold increase in cadaver organ donation numbers, the gap between transplants awaited and organs available continues to widen alarmingly. 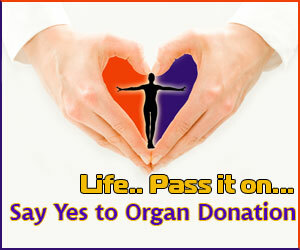 Around 5 lakh organs are required annually against this only 11,500 organ transplants happen in India. The Indian Transplant Registry has recorded only 20,952 kidney transplants in the last 42 years. India finds itself at an abysmally low position with 0.8 persons per million of its population having donated their organs, in comparison to countries like Spain and Croatia which have recorded numbers exceeding 35 pmp. Organ transplantation has been progressively accepted as the treatment for a number of health conditions resulting due to failure of organs worldwide and in India as well. Despite this, in India, among the millions who suffer from end-stage organ failure, only less than 10% are able to get timely help. This has been attributed to lack of awareness about organ donation and in most cases family refusal owing to certain superstitions and myths. The concept of brain death, its clinical diagnosis and possibility of donation following it continue to remain a grey area which also contributes to the low rates of donation. The Transplantation of Human Organs Act that was passed was in 1995 which made brain death acceptable has helped the state governments and medical fraternity to run cadaver transplant programmes quite successfully. The need of the hour is sensitizing the public and the doctors about organ donation facts and the concept of brain death. It is also important to encourage them to have a discussion with their loved ones about their wish to be organ donors which would help in overcoming barriers at the time of actual donations. An information booth was setup by MOHAN Foundation for two days inside the busy Mumbai railway station, which is also a UNESCO World heritage site that receives an average footfall of around 6.3 lakh passengers per day. Information brochures containing facts about organ donation were handed out to the commuters and donor cards were given to those who registered as organ donors. MOHAN Foundation has taken initiatives to organize many such campaigns and train a number of volunteers to spread the message of organ donation far and wide.